Last Friday, January 3, about 65 people braved the winter cold of Washington, DC (okay, compared to Midwest right now, it’s balmy) to participate in a discussion on the relevance of history to Americans. Leading the discussion with me were Tim Grove of the Smithsonian Institution and Cathy Gorn and Kim Fortney of National History Day. It was an exciting mix of participants. The room was not only filled with historians who were attending the American Historical Association conference, but also people who work at history organizations in the DC region. These various perspectives sparked a convivial and lively discussion (especially when we debated the difference between opinion and perspective). 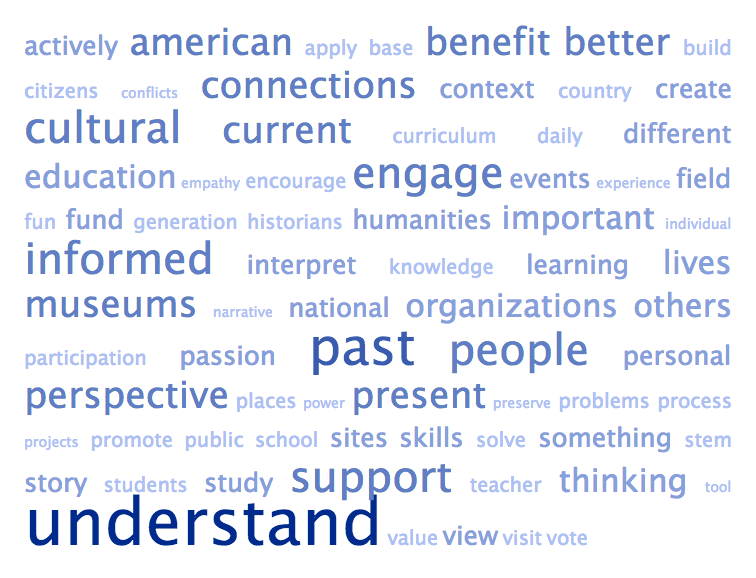 Most frequently mentioned words when asked about the relevance of history. Know the individual and society benefits of broad historical study and engagement. Apply historical thinking for the benefit of themselves and society. Feel pride, confident, and inspired. Engage in democratic and civic processes. We then solicited their reaction to the five Big Ideas that came out of previous discussions. No one had any comments about “developing critical thinking skills,” but “forming identity,” “encouraging civic engagement,” “building leadership,” and “creating a legacy” received lots of attention. The major comments concerned how these ideas are (or are not) unique to history (e.g., leadership happens in sports and Scouts, too), they seem to be overused jargon (e.g., “civic engagement”), and imply exclusiveness. The term “legacy” seemed especially troublesome and in need of clarification. Some alternatives suggested were plural forms (e.g., identities and legacies), defining whose identity or legacy, and substituting civic or leadership with community, connections, or participants (everyone can’t be a leader). Several people suggested that relevance and meaning must go beyond the individual and personal interest to include the broader community (e.g, “identity can’t stop with me”). We also received several suggestions to add the value of history in building confidence, pride, and independence; that it recognizes change over time in context; distinguishes what is significant; identifies things what happened in the past that affect life today; and have an emotional and affective impact (e.g., joy, entertainment that comes from doing history, and empathy of other people past and present). To our list of potential stakeholders and activists in this effort, we received suggestions of groups that focus on non-American history, for-profit groups such as Ancestry.com, the Gilder-Lehrman Institute, Khan Academy, textbook publishers, tribal groups, and library societies. UTeach at University of Texas at Austin: STEM teachers required to take “Perspectives,” a course on the history of math and science. Brooklyn Historical Society working with teenagers in after school and collaborative programs. Thanks to everyone that participated and if you’re not familiar with the History Relevance Campaign, you’ll want to read my earlier post or join the group on LinkedIn. Our next scheduled session is at the annual meeting of the National Council on Public History in March 2014. This entry was posted in Community engagement, History and tagged American Historical Association, History Relevance Campaign on January 7, 2014 by Max van Balgooy. I’d add to this list the Civil War Washington Teacher Fellows program, run by a consortium here in D.C., that works to engage teachers in thinking about how the history of the District is linked to its present state from a variety of perspectives, and how they can engage their students in that thought process. You can learn more at the websites of: Ford’s Theatre (www.fords.org); Frederick Douglass National Historic Site (www.nps.gov/frdo); President Lincoln’s Cottage (www.lincolncottage.org); and Tudor Place Historic House (www.tudorplace.org).